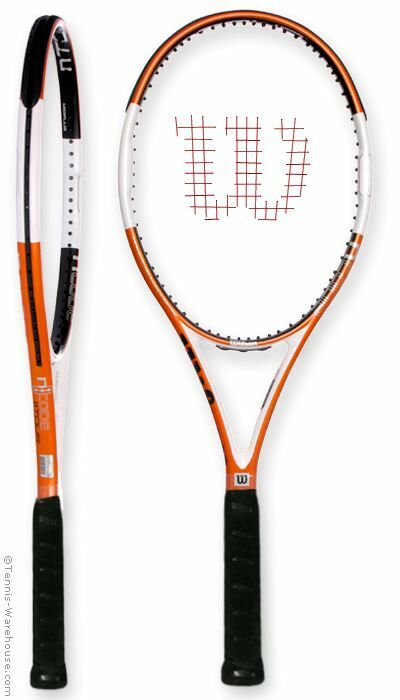 Kei Nishikori’s new wespon will be Wilson ULTRA TOUR 95CV. It was news realeased in Japan on Nov5. Burn 95CV+CRUSH ZONE(it’s used in existing ULTRA). The shop will sell it from Dec7. Kei's new weapon will be the same as his old weapon, but now at least I know what the new paint job means. So a lighter real tour frame for the Japanese market. I thought that i read on the forum that Nishi played with a heavier kind of Wilson Steam? I m still puzzeled by the crush zones of the new Tour frame. Is this a usefull feature for pro's who out of frustration often throw their racquets on the court? Than this feature could be a hit too for parents on low budget that dont want to buy a new racquet everytime their child smashes a racquet on the court. Anyone who can understand Japanese, Fukky's channel has 2 videos posted of the 95CV. One a promo presentation and the other being the playtest. We didn’t know what we had, nor the fate that was to befall the Radical. Graphene heralded the death of HEAD. Lest Wilson heed fates warning with the scourge that be named "CV"... history may repeat itself. AFAIK the second version, Ntour Two. Still amazes me that people think the racket a player endorses is the racket he plays. He will be playing his usual racket with a new Ultra Tour 95 paintjob. Only thing I could make out (my japanese is a little rusty these days) is that they have stolen the idea of woofer grommets from Babolat? Watch on youtube after you turn on cc. The select auto translate. It gives you a few more words than my Japanese vocabulary. Well I was just going off of what Wilson’s official IG site has said. You’d assume that would be as close to definitive as we could get. Especially with me mentioning that there was talk of a 16/18 for it now to be a 16/20 we need a more open pattern essentially. They than said yea it will be a 16/18. Hence my post last night. But this morning I got an notification from a tag by them saying this........so even they don’t know the information. Of course we are all confused. I assume there hasn't been a new dealer book released. The first one with this frame, I have a photo, indeed says that the frame has a 16x18 pattern. It has been disproved by TW and all other sources which already have the frame. They were probably just going by the book they had, nothing more. i like this pattern and size racquets for the 1hbh so im gonna try it at some point, hopefully soon..
Any word on weather the Burn line will be discontinued? I noticed Halep is also using an Ultra as well. The Burn has been condensed to a pre-strung, Spin Effect only line consisting of the 100S, 100LS and 100ULS. To me they look like they switched to a cheaper paint with the new look of the updated models (racquets now sell at $139 - 179). So....... this is EXACTLY the same as the burn 95, with same graphics, just different colours and name?! And currently more than double the price? Ouch. Wilson doesn't make new rackets, they just repaint them. Apparently they dont do that very well nowadays either! As mentioned in the pro gear thread the difference is the grommet throat piece - I think in order for it to fit the mold is slightly different in that area but other then that, no changes - I like the change since it makes it easy to spot that a player is using a paintjob rather then the updated model.